Overheard a bass angler at the boat ramp tell another guy that he recorded a water temp of 53 degrees, which means we're only ten degrees or so away from the spawn. The carp themselves seemed to confirm that something of import is imminent, schmoozing around on the flats in nervous packs of five or six and resolutely ignoring any fly cast their way. Had to search for lone losers cruisers to have any shot at a hook-up. Managed to bring four such individuals to the net. Two came on a Zimmerman Backstabber (tied by Lonny Garris for the McTage fly swap. Thanks Lonny!) and two came on the MF'er. Sounds amazing, send warmer water my way. Sweet. 40 degrees out here...but who is counting? Man, you are practically gonna have your whole swap package broken in before the rest of us really get started! Ok thats so cool to see. I am so happy the fly worked out for you. If the wind ever stops here in Colorado I might be able to get out and break in my flies as well. My last trip had a spring influenced pond at 49F from 42F earlier in the month, and I had shots very close in very dirty water. I'm very encouraged when our temps reach 49, super so when the 50's are here. I'm super pleased for you! I am tying and am so tempted to try a trip though my leg is still in a near full cast. This is killing me, watching things warm all around. Keep fishing and catching, sure makes me feel closer to the fish. It's pretty darn good, Nate. This mild winter has made for some ideal conditions carp-wise. Tell you what John, I'll swap a few degrees on the thermometer for a couple of those 20 lb. 'ers you'll be catching in a few weeks. I don't know McTage. I have a feeling you'll more than make up for lost time once you get some warm weather. Bill, I'm starting to think that your mis-spelling of "carp" isn't accidental! Yep, Lonny, that's a great fly. Won't be the last time Georgia carp see that one. Thanks again! Agree with that Gregg. Once the water temps hit the upper forties and lower fifties, the carp really start moving around here. Should be all good from here on out. Bummer about your leg. Hope that thing heals up quickly so you can get out there! Hmmm...It snowed at my house yesterday. Good for you Ty that you have warmer weather and you are already getting out. Gotta admit, Mr. P, it has been nice to get out. 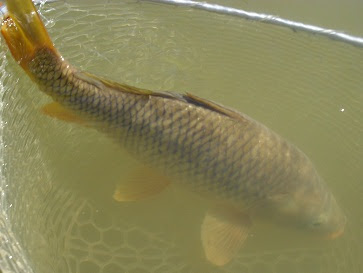 Carp in February. That's good, very good. Yep, I'll take it, Lowbrow. This warm winter doesn't hurt.